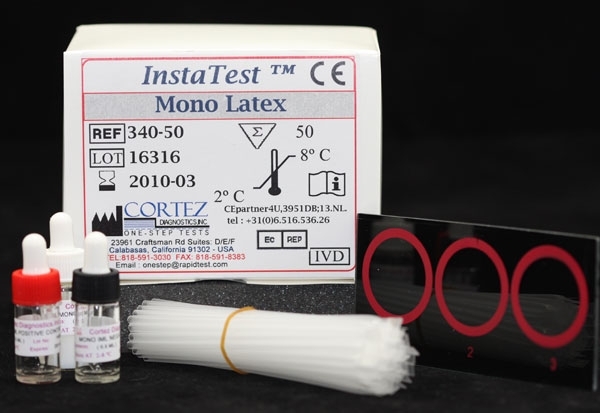 INTENDED USE The Infectious Mononucleosis (IM) Latex Test (Serology Test kit) is intended to be used for the qualitative and semi-quantitative determination of human heterophile antibodies associated with IM. INTRODUCTION Paul and Bunnell1 were the first to report that serum from a patient with IM contained heterophile antibodies that agglutinated sheep erythrocytes. These heterophile antibodies react with an antigen that apparently is not responsible for their production. However, it was soon discovered that the test lacked specificity because the naturally occurring Forssman antibody found in serum from some individuals who apparently have not had recent infectious mononucleosis agglutinates unmodified sheep or horse erythrocytes2. In 1937, Davidsohn3 employed a different absorption procedure that removed the Forssman antibody but retained the heterophile agglutination characteristic of IM. The Davidsohn modification added distinction but made the test time-consuming and cumbersome to perform. Therefore, the Davidsohn test has been relegated to the role of a reference method for diagnosis of IM. Attempts to find a suitable alternative were made by Bailey and Raffel, 4 and they discovered that bovine erythrocytes were more sensitive than sheep or horse erythrocytes for detecting IM heterophile antibodies. Since that time, antigens that have been extracted from bovine red cell walls and have been used in various enzyme immunoassays which are both highly sensitive and specific for heterophile antibodies associated with IM5. PRINCIPLE The IM Latex test provides a suspension of polystyrene latex particles that have been coated with partially purified glycoprotein from bovine red blood cells. The heterophile antibody associated with IM bind to the corresponding antigenic determinants on the glycoprotein coated latex. This binding is evident by rapid agglutination of the latex. As a result of the purification of the bovine red cell glycoprotein, the coated latex particles are not agglutinated by Forssman or serum sickness antibodies at levels normally encountered in the U.S. population. Thus, no differential absorption is required.